Cyclist's palsy - it's real! I did my 2nd century about 10 days ago. Ended up with 114 miles and 6,000 ft of climbing, and a tad over 8 hours in the saddle. Next morning I woke up and my right hand wasn't "right" - the little finger and ring finger were weak and refused to cooperate like they usually do. By Monday it wasn't any better so I Googled it and the term "Cyclist's palsy" came up. Now, 11 days after the ride, I've got about 70% function in those two fingers. It's coming back but man, it's gradual and slooooow. Anyone else have an issue like this? I read where 2 factors come into play - one, a long bike ride, and two, a weak core. That would be me on both counts as I'm 6'-1" and 244 lbs. Been riding for 20 months and 6,000 miles, so definitely not a rookie. My first century was in September - 103 miles and 2,600 ft of climbing with no after effects. I had a bike fit done last Friday so hopefully that will help some going forward. How long did it take your hand(s) to get back to normal? Gary, to clarify: you had the fit done after you got numb fingers on a ride, or before? Important to know that there is more to ergonomics than bike fit. How is your core strength? Are your hip extensors tight? Are your lumbar extensors weak? Excessive tension in the shoulders, extending down to the hands? I actually had a doctor make that mistake too but she wasn't very good. Last edited by Machka; 03-21-19 at 01:10 AM. I have numbness in my left hand that I got on a 1200km ride last summer. I blame it on a road with expansion joints every 30 feet for miles and miles. It has finally subsided after 7 months, but it's still there to a small degree. I wouldn't say it ever was really weakness. I find that it almost always goes away after a month, sometimes as short as a week. But it can be permanent, so the best idea is to avoid it if possible. Seat back and longer stem takes weight off of the hands. Of course, that might not be your most powerful position, so tradeoffs are necessary. I had the fit after. My fit guy, Derek Reeves at The Bike Store in Warner Robins GA, said it was close but the tweaks he made should help for the next century. The biggest difference in the 1st century I did last September and this one 12 days ago was the steep hills. 1st was 2,600 ft and the hills were moderate. 2nd was 6,000 ft and the hills were often and steep. For my 244 lb frame, it was a tough ride. My core strength is average. I'm 59 y/o, have been cycling since June 2017 and other than weight am in good physical shape. The ulnar nerve is the culprit, from what I have read. I'm just wondering if someone else has had this happen, and how long it took to be back to normal again? I have numbness in my left hand that I got on a 1200km ride last summer. I blame it on a road with expansion joints every 30 feet for miles and miles. It has finally subsided after 7 months, but it's still there to a small degree. I wouldn't say it ever was really weakness. I find that it almost always goes away after a month, sometimes as short as a week. But it can be permanent, so the best idea is to avoid it if possible. It's good that you're thinking about this when it first starts happening, not just ignoring it until after a 600k or 1200k. One question I have is: are you moving your hands around while you ride, or parking them in your favorite place for long periods of time? For long distances, you want to have as many comfortable usable hand positions as possible. I get pretty bad carpal tunnel syndrome if I use integrated brake+shift levers. I'm not sure where that kicks in, somewhere in the 100km-200km range. It's bad enough that I've given up on integrated brake+shift levers entirely. Having separate brake levers, one bar end shifter, and one downtube shifter, forces me to keep my hands moving around the handlebar all the time, and this really helps. GCN has a video on this; the advice sounds pretty solid. I am very susceptible to it, so I stopped wearing cycling gloves most of the time, change my hand position a lot, and do a lot of core work to keep the weight off my hands. When I used to get numbness it could take several weeks to get the feeling back. Thanks, unterhausen, for sharing your story. It does sound similar. My bike fit guru had one client who said it took him EIGHT weeks to get his hand back to normal! I've backed off some with riding so as not to aggravate the condition any further. I didn't do my planned 70 mile ride last Saturday.... skipped tonight's 26 mile ride... but that's no fun either! One of the things I did to resolve my similar hand issues was to go from an aluminum bicycle to a steel bicycle for long distance riding. After 100+ mile days, I would have numbness in my hands which would last for over a week. Purchased a Specialized road bike with Futureshock as well as started running larger 30mm tires tubeless with lower pressures and numbness is gone. I mention this not expecting someone to run out and purchase a new bike and wheels but to highlight equipment can help. I would start with new gloves which may suit your hands better, double wrap padded bar tape, larger supple tires with latex tubes running lower pressures ect. It's also worth noting that it's possible to get numbness from things like gloves that impinge on the nerves. Not sure how that happens to the ulnar nerve, but I had a setup that would push on the carpal tunnel. Most cycling specific gloves have a gap there so it doesn't push on the nerve. Adding too much padding can cause this problem. The ulnar nerve probably is easier to push on. 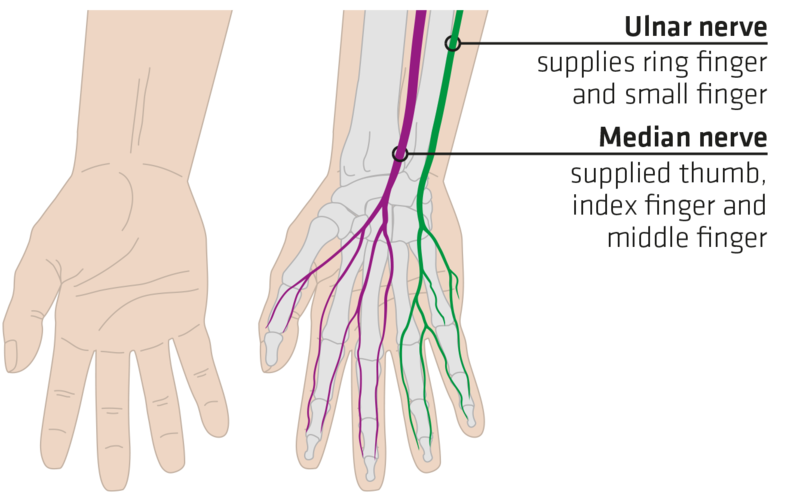 I think people with good setups are more likely to have ulnar nerve related numbness. Apart from what Machka says, also it is a good idea to run handlebars at the same height as the seat. My bikes generally have had that set-up for decades, as I see little point in having to lean forward and support the weight on my hands in contact with the bars. Gee, I very rarely have used the deepest sections of road bars -- occasionally in strong wind, but not even fast downhills. Some of my bikes have been fitted with single-level time-trial-style bars -- my FG still is, and I have been considering using my two or three other similar bars on my other road bikes, as well.. I'm surprised no one has mentioned using aero bars to relieve pressure on the ulnar nerve. I ended up having surgery about 20 years ago to free the ulnar nerve. The surgeon recommended using gel gloves for subsequent rides, but the only thing that worked for me was aero bars, Any time I start to feel my hand going numb, which usually happens about 20 minutes into a ride, I settle into the aero bars and the numbness goes away. I had a terrible case of numbness after my first century - it was in my right (dominant) hand, between the thumb and index/middle fingers (so apparently the median nerve). This was quite hilarious because I was teaching college courses, and since I could not grip anything properly I had to hold the chalk in my fist to write anything on the board. I was able to grip things well enough for daily life (writing, starting a car, etc.) after about two weeks, and full mobility returned after about three weeks. Part of the culprit was certainly bike fit. I was also a novice distance rider with a bit of the death grip later in the ride, and in addition, had reversed the brakes - so the front brake was operated by my right hand. I worked on bike fit and core strength, which made multiple hand positions easier, and also started wearing gloves. I no longer have issues with numbness. I can just imagine the classes when you had to use your fist to hold the chalk. After my first 600k, the arches of my feet were numb. Walking was fun for a couple of days. Yesterday was day 17 and was the first time my right hand has felt and acted "normal" since the 114 mile ride on 3/9. I'd say it's about 95%... still not all the way back but very close. A) I ride a 2015 Cannondale Synapse. Biggest tires I can run are Continental Grand Prix 4000 II in 25mm (they measure 26mm with my calipers). B) I wasn't wearing my fave pair of gloves - I won't make that mistake again. C) Riding last night for the 3rd time since I had a new bike fit, it felt 'right' and that could make a big difference in the next long ride. THANK YOU for all of your responses - I mean that! I found that small changes in fit make a big difference. Not that I have a very sporty fit though.